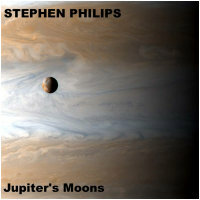 Stephen Philips has long been reknowned in the ambient community, both for his deep evocative ambient music, as well as for being the person behind the Dark Duck Records music label, which hosts a huge collection of ambient music available both for sale and for free download (via the Drone Download Project). Thus, we couldn't be happier that Stephen Philips has returned to Earth Mantra with yet another jaw-dropping release, this time a studio project not a live performance. Called Jupiter's Moons, this is the perfect soundtrack for a restful journey through the outer solar system. Blending evocative sound design with lush waves of tonal majesty, this is a superb release, one of our favorites by Stephen. The music is smooth, uplifting, peaceful, and deep - and ideal for meditating, deep listening, or just kicking back in an easy chair with a pair of headphones. We love this release and are sure that you will too.